I have no idea how this summer has completely passed me by but somehow it has, alas, I return to school tomorrow. I’m excited and depressed, the typical back to school feelings you know. But really, I think I’m mostly depressed because I somehow thought this summer would be just overflowing with time to do things like decorate my house and be clean and organized. But, like, I just got around to all of those things last week. For real. Each room is coming along really slowly. Mainly because I keep doing like 10 projects at once instead of focusing in on one room at a time. I guess I like to be an everywhere, doing-a-million-things-at-once, all around mess of a person! Idk! But anyway, I’ve actually been pretty proud of myself for keeping my craft room decently clean most of the time. And honestly, when it is a disaster, it’s not my fault! I swear! That tornado of a baby I’ve got can tear a craft supply shelf to pieces all over the floor in POINT TWO SECONDS! It’s impressive almost. Regardless of how messy it may or may not be 75% of the time I’m in there (because Stella is in there with me) I still want it to be a cute room! So I got started with some new tables, reorganization and this all new chair! Ok, all new is a total lie cus really it’s just all new to me, it’s thrifted! I got this West Elm cast off for $5 at Goodwill and I couldn’t have been happier! With a shape like that, it could’ve been left cream and silver and still been a great addition to my space. But of course, I had to DIY it a little. 2. Paint the whole thing white. I didn’t focus too much on the top back of the chair since I knew it’d be painted mint later on. 3. Tape off a diagonal line across the seat of the chair then cover the part you want to remain white, I used another plastic tablecloth to cover that part. 4. Paint that your second color, I chose ballet slipper pink and just focused painting along my tape line. 5. 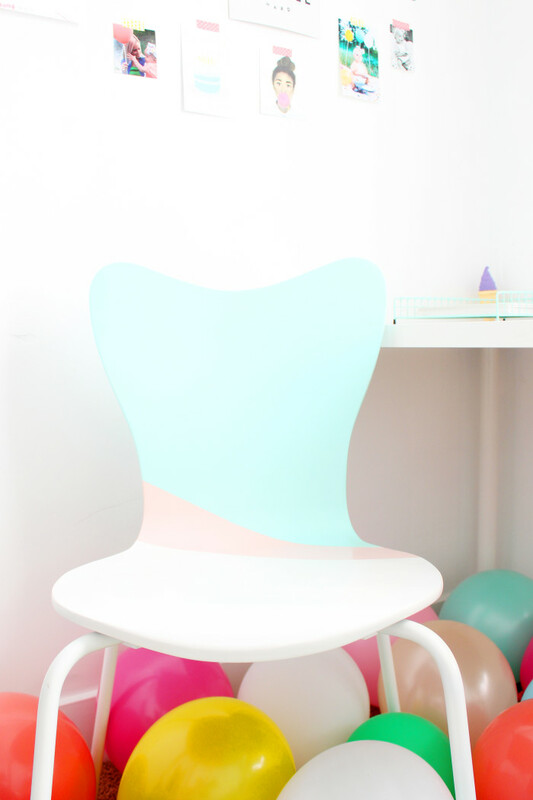 Tape over the pink, following your same line but then I cut straight across on the back of the chair. I guess I have no picture of this :/ sorry! 6. 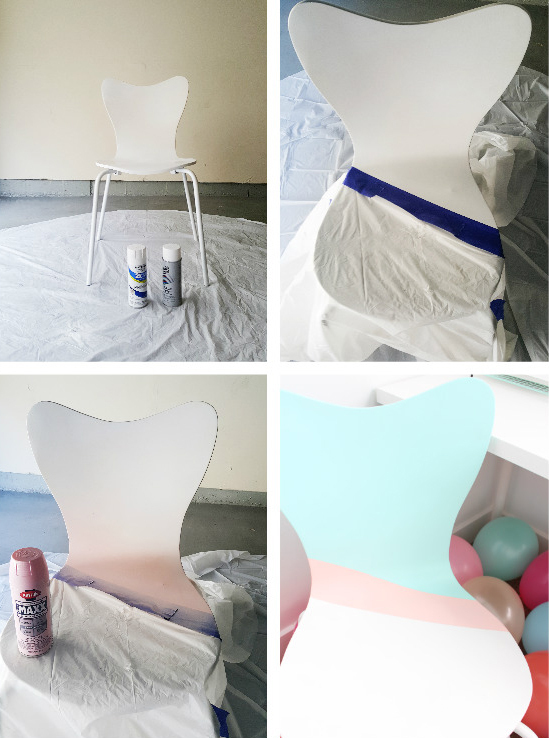 Spray the top and back of the chair the third color. Mine was Rustoleum mint green. I love this little statement piece for my craft room although I do have to admit, I hardly ever sit down in there haha! Regardless, every office needs a chair, right? So my room feels complete even if it is needless! Such a lovely chair! 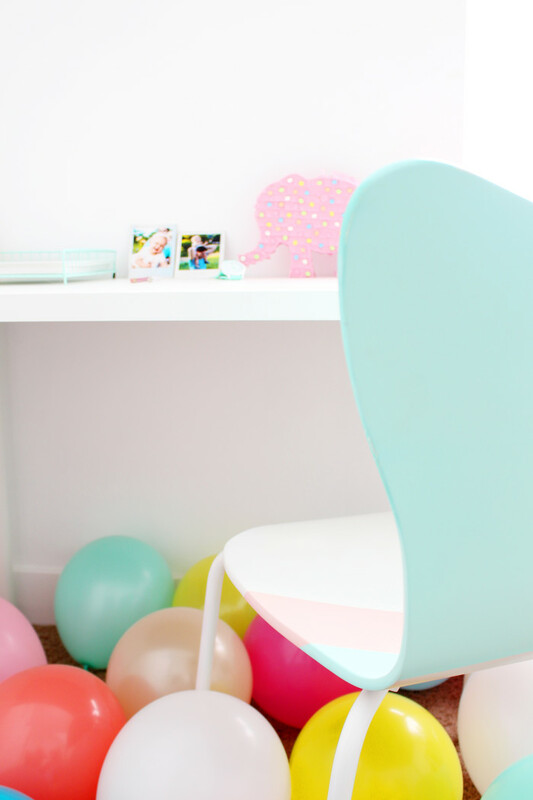 Love the colorblocking, also love the balloons! The pictures are so festive! Thank you so much Monique! Balloons make everything more fun!! Ahhh I love this! Such a cute idea. And what an AWESOME thrift shop find!